Justice D Y Chandrachud has done it again. While striking down criminalisation of adultery under Section 497 of IPC as unconstitutional, he has overruled his father's judgment which had upheld the section. 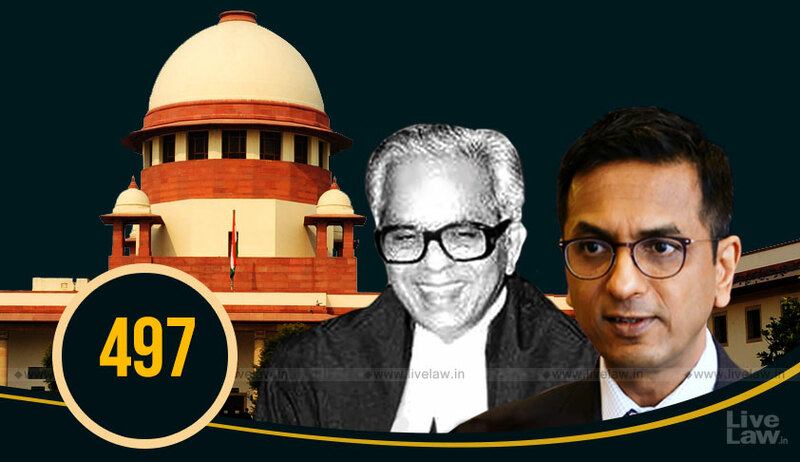 In 1985, a judgment authored by Justice Yeshwant Vishnu Chandrachud, father of Justice Dhananjaya Chandrachud, in Sowmithri Vishnu vs.Union of India had upheld the constitutional validity of the section.This has been overruled by Justice D Y Chandrachud in Joseph Shine v Union of India. This instance of Justice Chandrachud overruling father's judgment is happening for the second time. The first occasion was in the privacy judgment, when Justice D.Y.Chandrachud held that the judgments rendered by all the four judges including his father constituting the majority in ADM Jabalpur were seriously flawed. Almost the very same arguments as in Joseph Shine were raised in Sowmithri Vishnu against Section 497 -(1) it confers upon the husband the right to prosecute the adulterer but, it does not confer any right upon the wife to prosecute the woman with whom her husband has committed adultery; (2) it does not confer any right on the wife to prosecute the husband who has committed adultery with another woman; and, (3) it does not take in cases where the husband has sexual relations with an unmarried woman, with the result that husbands have, as it were, a free licence under the law to have extra-marital relationship with unmarried women; and (4)the section is a kind of 'Romantic Paternalism', which stems from the assumption that women, like chattels, are the property of men. However, these arguments were dismissed by Justice Y V Chandrachud. He described them as "have a strong emotive appeal but they have no valid legal basis to rest upon". It was held that a penal provision cannot be held unconstitutional merely because it punishes man alone. "It is commonly accepted that it is the man who is the seducer and not the woman", he observed in the judgment, endorsing the general impression which shaped the provision in that manner. The second argument was dismissed holding, "No grievance can then be made that the section does not allow the wife to prosecute the husband for adultery. The contemplation of the law, evidently, is that the wife, who is involved in an illicit relationship with another man, is a victim and not the author of the crime". He also observed that "the offence of adultery as defined in that section can only be committed by a man, not by a woman", echoing the prejudice that woman is always a victim in a adultery as she lacks agency to be a willing participant in it. The third argument was dismissed observing that the section was concerned with dealing with the evil of "a man seducing the wife of another", and that a provision cannot be declared unconstitutional for under-inclusion. The argument that the section violated gender equality by its paternalistic treatment of women was also dismissed. "The alleged transformation in feminine attitudes, for good or bad may justly engage the attention of the law-makers when the reform of penal law is undertaken". A degree of condescension is palpable in these words of Justice Y V Chandrachud. He sounds dismissive and cynical of the transformation in 'feminine attitudes', and qualifies it with 'alleged', indicating unwillingness to acknowledge any progressive change in gender equations. In a turnaround of things, all the above arguments found favour with the Supreme Court in Joseph Shine. Accepting all these arguments, the judgment of Justice D Y Chandrachud has overruled Sowmithri Vishnu. "The law in adultery is a codified rule of patriarchy.Society attributes impossible attributes to a woman, Raising woman to a pedestal is one part of such attribution", these conclusions in Joseph Shine are a long away from the dismissive notions expressed by Justice Y V Chandrachud regarding changing gender equations. Joseph Shine is a refreshing change from the notions of deep rooted gender stereotypes, which reverberated in Sowmithri Vishnu. "Sowmithri Vishnu’ fails to deal with the substantive aspects of constitutional jurisprudence which have a bearing on the validity of Section 497: the guarantee of equality as a real protection against arbitrariness, the guarantee of life and personal liberty as an essential recognition of dignity,autonomy and privacy and above all gender equality as a cornerstone of a truly equal society. For these reasons, the decision in Sowmithri Vishnu cannot be regarded as a correct exposition of the constitutional position. Sowmithri Vishnu is overruled", this was the declaration made by Justice D Y Chandrachud in Joseph Shine. During the course of hearings too, Justice D Y Chandrachud had expressed disapproval of the 1985 judgment. The constitutionality of the Section was challenged for the first time in 1954. However, the scope of challenge was limited then, as it was based on the exclusion of women from punishment. But it was upheld by the Supreme Court in 1954 in Yusuf Abdul Aziz v State of Bombay, holding that the it was a beneficial provision for women as per Article 15(3) of the Constitution of India. The Section -which was twice upheld earlier, in 1954 & 1985- has been now invalidated by the SC, in tune with the expanding horizons of individual liberty and gender parity. This also showst that the SC will not remain a passive prisoner to its earlier judgments; and that a son will not be always bound by his father!